We visited Fred’s on a weekday around 10am, and we were lucky to get two seats at the counter. The place was bustling, and has a great ‘diner’ look and feel. Although the special of the day was meatloaf (which looked pretty good judging by what I saw being dished out), we were in the mood for breakfast. I ordered the #3, which is two eggs, corned beef hash, and homefries with toast. Don’t let my picture put you off- nothing is burnt. 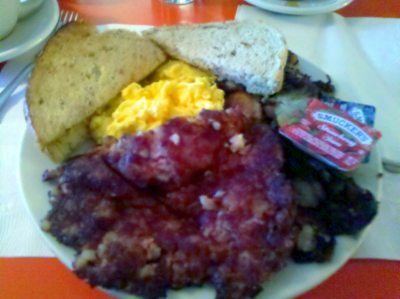 I specifically asked for the hash and the homefries to be well done, and they were perfect- both fried up very crisply. The hash wasn’t homemade- it seemed to be canned like the Armor brand that I buy at the grocery store. But, that’s not a complaint- I wasn’t under the impression that it would be homemade. As it turns out, it was really good. 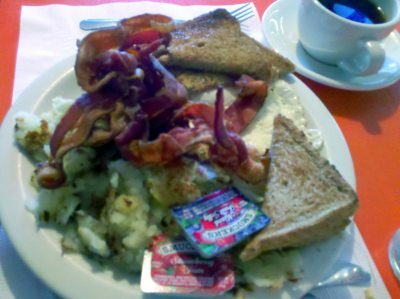 My companion ordered the #2- two eggs, bacon or sausage, homefries, and toast. See that big, tangled mass in the picture? It’s bacon- a ton of crispy, delicious bacon. It’s more bacon that you ever seem to get at a restaurant. I understand that bacon isn’t cheap, but then again, it’s not the most expensive meat, either. So, I’ve never understood why some places only give you 2 strips of an extra $2 or whatever…other than the fact that they can. Anyways, that’s not the case at Fred’s. We also ordered one pancake just so that we could try it. It was very good. The portions are so large that after finishing off the pancake, we were only able to finish off half of our meals and took the rest home (I’m a bit of a nut about taking leftovers with me-I hate to waste food, and I’m kind of cheap. I’ve found that thinks like the homefries, french fries, and pizza heat up great in my toaster oven). If you happen to be in the Akron area and you’re looking for good food, large portions, and reasonable prices, stop by Fred’s. 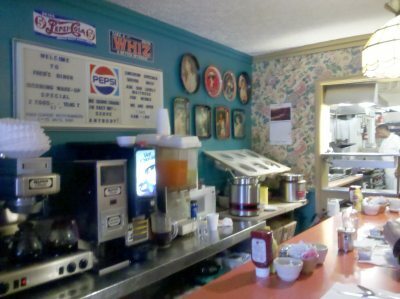 It’s a pretty cool diner atmosphere, and it seemed like there were quite a few regulars, so that tells you something. I hope to go back soon and try some non-breakfast food. John Herbert, III on Best Breakfast in Akron. Welcome to Fred’s Diner. Fred on Best Breakfast in Akron. Welcome to Fred’s Diner. David Gilcreast on Best Breakfast in Akron. Welcome to Fred’s Diner. Kim on Best Breakfast in Akron. Welcome to Fred’s Diner.